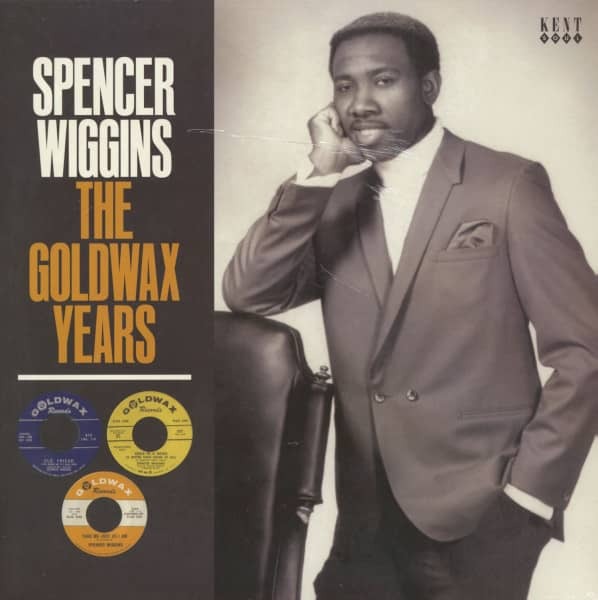 Spencer Wiggins was born January 8, 1942 and is an American Soul singer, who recorded for Quinton Claunch's and Rudolph Russel's 'Goldwax label'. He today is a church minister but still performs his secular material around the world. 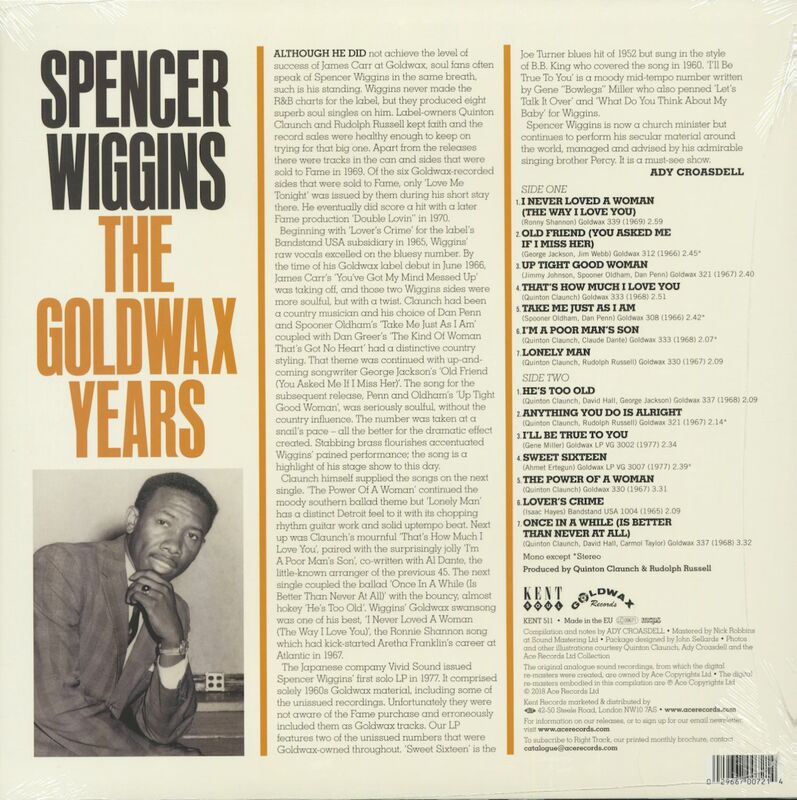 Although he did not not achieve the level of success of James Carr at Goldwax, soul fans often speak of Spencer Wiggins in the same breath, such is his standing. Wiggins never made the R&B charts for the label, but they produced eight superb soul singles on him. Label-owners Quinton Claunch and Rudolph Russell kept faith and the record sales were healthy enough to keep on trying for that big one. Apart from the releases there were tracks in the can and sides that were sold to Fame in 1969. Of the six Goldwax-recorded sides that were sold to Fame, only love Me Tonight' was issued by them during his short stay there. He eventually did score a hit with a later Fame production 'Double Loan" in 1970. Beginning with 'Lover's Crime' for the label's Bandstand USA subsidiary in 1965, Wiggins' raw vocals excelled on the bluesy number. By the time of his Goldwax label debut in June 1966, James Carr's 'You've Got My Mind Messed Up' was taking off, and those two Wiggins sides were more soulful, but with a twist. Claunch had been a country musician and his choice of Dan Penn and Spooner Oldham's 'Take Me Just As I Am' coupled with Dan Greer's 'The Kind Of Woman That's Got No Heart' had a distinctive country styling. That theme was continued with up-and-coming songwriter George Jackson's 'Old Friend You Asked Me If I Miss Her)'. The song for the subsequent release, Penn and Oldham's 'Up Tight Good Woman, was seriously soulful, without the country influence. The number was taken at a snail's pace - all the better for the dramatic effect created. Stabbing brass flourishes accentuated Wiggins' pained performance; the song is a highlight of his stage show to this day. Claunch himself supplied the songs on the next single. 'The Power Of A Woman' continued the moody southern ballad theme but 'Lonely Man' has a distinct Detroit feel to it with its chopping rhythm guitar work and solid uptempo beat. Next up was Claunch's mournful 'That's How Much I Love You', paired with the surprisingly jolly 'I'm A Poor Man's Son, co-written with AI Dante, the little-known arranger of the previous 45. The next single coupled the ballad 'Once In A While In Better Than Never At All)' with the bouncy, almost hokey 'He's Too Old'. Wiggins' Goldwax swansong was one of his best, 'I Never Loved A Woman The Way I Love You)', the Ronnie Shannon song which had kick-started Aretha Franklin's career at Atlantic in 1967. Joe Turner blues hit of 1952 but sung in the style of B.B. King who covered the song in 1960. '1'11 Be True To You' is a moody mid-tempo number written by Gene "Bowlegs" Miller who also penned 'Let's Talk It Over' and 'What Do You Think About My Baby' for Wiggins. Spencer Wiggins is now a church minister but continues to perform his secular material around the world, managed and advised by his admirable singing brother Percy. It is a must-see show. Customer evaluation for "The Goldwax Years (LP)"